Top NATO General Egon Ramms: "Neither Success nor Failure can be taken as granted". General Egon Ramms with Afghan boys: "The new counterinsurgency strategy is a population-centric one and defines the protection of the people as mission"
Since January 2007, the four-star German General Egon Ramms has been Commander-in-Chief of the Allied Joint Force Command in Brunssum, The Netherlands. As such, he commands ISAF military operations in Afghanistan and ranks above ISAF's commander on the ground General David H. Petraeus. General Ramms can look back on an extraordinary career in the German Army. Before taking over command in Brunssum he was Commanding General of the Multinational Corps Northeast in Stettin, Poland. Well known for his fighting spirit and his frank, open speech, General Ramms is driven by responsibility for his soldiers on the ground. He also regards himself as senior advisor to all troop contributing countries. Brig Gen (ret) Dieter Farwick, former Chief of Operations at NATO HQ Brunssum (then AFCENT - Allied Forces Command Central Europe), and now Global Editor WSN, took the opportunity to interview General Ramms on the current situation and potential future development of the ISAF operation in Afghanistan. WSN: From the very beginning of NATO's "out-of-area" military operations, your HQ has been central to numerous operations that were different in size, character, geography and climate. What are the main lessons learned from these different commitments? General Egon Ramms: One of the most important lessons that we have identified is that the civilian aspects of an operation have an increased importance in all types of conflict but particularly in counterinsurgency. The idea that there could be a military solution for insurgency is unrealistic. Operational experience demonstrates that today's challenges require a comprehensive approach, involving a wide spectrum of civil and military instruments, while fully respecting mandates, autonomy and decisions of all actors. In this regard, our planning process recognizes that the provision of security is linked to the pursuit of good governance and development. Together with this integrated civil-military approach to operations, we also have to ensure a regional approach to our operations. A proper coordinated and coherent involvement of the states neighbouring the area of operations is necessary in order to guarantee a long-term solution. A very important lesson that we have learned is that we need to improve our capabilities to act in whatever circumstance regardless of the exact mission. Missions in remote areas require capabilities that ensure our forces are flexible, mobile and versatile. The understanding of the social and cultural environment of the area of operations has a major impact on the way we plan and execute our missions. The way people think and act, their values, customs and social practices as well as the local social and political structures need to be understood in order for us to adopt the right strategies and to avoid any unwanted outcomes. Another lesson that we have learned is that we have to improve our public communication. We need to create and sustain a public awareness of the mission, its nature and importance in order to ensure the support of the people in our nations and of those in the area of operations. WSN: What are the procedures within NATO for the generation of forces for operations? What is your HQ role and mission within the NATO structure? General Egon Ramms: In general, NATO does not have independent military forces, other than those contributed by the member countries to military operations. Consequently, when the North Atlantic Council (NAC) decides to start an operation, forces have to be made available by member and partner countries through a force generation process. When a NATO operation is considered necessary, NATO's military authorities draft a concept of operations that outlines the troop and equipment needs necessary to meet the operation's objectives. Upon approval of this concept of operations and the release of a "Force Activation Directive" by the NAC, Allied Command Operations (ACO) initiates the force generation and activation process. National offers to provide personnel and equipment are addressed during conferences attended by representatives from member and partner countries. Contributions by individual countries are subject to their overall national capacity, taking into account prior commitments, force size, structure and activity level. Every contribution, whether big or small, is valuable and contributes to the success of the operation. JFC Brunssum is one of the three operational level NATO headquarters that is responsible for planning, conducting and sustaining a full range of military operations. JFC Brunssum is capable of commanding one major and two small joint operations concurrently. Currently, it is the out-of-theatre operational level headquarters responsible for the International security Assistance Force in Afghanistan plus some other missions like Baltic Air Policing and NATO Response Force 15 starting at the 1st July 2010. WSN: Why is NATO in Afghanistan? What is the role and mission of the International Security Assistance Force in Afghanistan and what is the role of your HQ in this mission? General Egon Ramms: As a failed state under the Taleban, Afghanistan exported terrorism, instability and crime to its neighbours and to the rest of the world. In December 2001, the ISAF mission was created in accordance with the Bonn Conference with a mandate in accordance with Chapter VII of the UN Charter. In August 2003, upon request of the UN and Government of the Islamic Republic of Afghanistan (GIRoA), NATO took responsibility for ISAF and gradually expanded to cover all of Afghanistan. Today, NATO and the wider International Community stand by the democratically elected GIRoA to help create a secure and stable environment for the people. ISAF collaborates with the international community in an integrated approach to advance the three pillars of security, governance, and development as specified in the Afghan National Development Strategy. ISAF leads the security effort and will support the governance and development efforts. To carry out its mission, ISAF conducts security and stability operations in partnership with Afghan National Security Forces (ANSF) and provides support to the Government and International Community in Security Sector Reform, including mentoring, training and operational support to the Afghan National Army and the Afghan National Police. Together with troops from all Allies, eleven partner nations, five contact and two Arab countries contribute to a total of 46 Troop Contributing Nations. This clearly demonstrates the legitimacy and support for our mission in Afghanistan. JFC Brunssum is the NATO out-of-theatre operational command that carries out NATO's prime mission by ensuring that ISAF can sustain its operations uninterruptedly looking ahead over a period of several years. JFC Brunssum provides continuous support through management of supplies to sustain the operations, coordination of manning and training of designated ISAF personnel to enable their smooth transition into ISAF. General Ramms with ISAF soldiers: "The success of our mission depends on the political will of ISAF nations"
WSN: You have an experienced staff here in Brunssum and also on the ground at all levels. We all know that the military cannot win a conflict or a war alone. Military commanders need civilian partners to succeed, as the saying goes: no development without security, and no security without development. What is your view? General Egon Ramms: ISAF plays a supporting role to the GIRoA. Under UNAMA's (United Nations Assistance Mission to Afghanistan) leadership, ISAF works in close coordination with other international partners (including UNAMA), the G8 lead nations, the World Bank, the European Union and the development community to facilitate and foster the implementation of the Afghanistan Compact and the Afghan National Development Strategy (ANDS). NATO and ISAF Foreign Ministers have endorsed the updated political and military plan (Comprehensive Strategic Political Military Plan) for Afghanistan. This plan provides the framework for ISAF's engagement in Afghanistan and for its contribution to wider international community efforts in support of the Afghan Government. The enduring principles underpinning the plan are: shared long-term commitment; enhanced Afghan leadership; enhanced coordination and a regional approach. The NATO Senior Civilian Representative in Kabul has a close partnership with COM ISAF and UNSRSG to maintain synergy between NATO/ISAF's military and civilian efforts under its UN mandate. ISAF communicates and coordinates with the GIRoA on a daily basis and at multiple levels of command. Also, ISAF and the SCR play a full role in the Joint Coordination and Monitoring Board. Co-chaired by the president's chief economic advisor and the UNSRSG, this body comprises the key GIRoA and International Community actors charged with implementing the Afghanistan Compact and the ANDS. 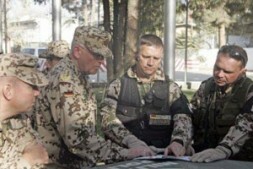 WSN: After almost nine years of NATO and ISAF involvement Afghanistan remains, without doubt, far from stable and secure. What is the situation now? General Egon Ramms: The security situation in Afghanistan is serious and complex and neither success nor failure can be taken for granted. On one hand, the conflict in Afghanistan can be viewed as a set of related insurgencies, each of which is a complex system with multiple actors and a set of interconnecting relationships among those actors. On the other hand, we face not only a resilient insurgency; there is also a crisis of confidence among Afghans. To improve security we must disrupt and degrade the insurgents' capacity, deny their access to the Afghan population, and strengthen the ANSF. This requires steadfast commitment and incurs significant costs. But, we remain committed to helping the Afghan people. At the same time, military efforts alone cannot bring peace and stability. Developing Afghanistan's infrastructure, economy and institutions are all vital components of the international community's strategy in Afghanistan. However, the Forces uplift which we have are still conducting until November has enable us in key terrain districts to act together with the increased numbers of Afghan Army and Afghan Police in a way and to a level we have never been able to before. This gives me cautious confidence from military point of view. But we depend still on further progress on delivering "Good Governance" and further increase in development. These two areas we do not own, but they influence the progress of everything. WSN: Under public pressure, some nations have set deadlines for the end of their commitment in Afghanistan. Other nations have announced that they will start withdrawing their troops in 2010 or 2011 if Afghanistan is able - politically and militarily - to take over responsibility. What are, or should be the criteria for the start of any withdrawal? 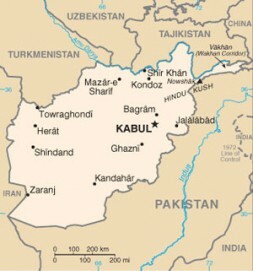 Do you expect that the Afghan central government will be able to take over in 2010 or 2011? Do you expect that the Afghan military and police will be sufficiently trained and equipped within this time frame to take over? What, in your view, is a realistic time horizon for any start of ISAF's troop reductions? First, there are the deadlines set by some nations to end their military commitment in Afghanistan. In this situation, and also to ensure the best approach of the fluid situation in the field, ISAF continues to reposition its forces. At the same time, ISAF, the Afghan National Army (ANA) and the Pakistan Military coordinate tactical level operations along the border and they will continue to improve cooperation and information sharing. The second issue is the transition of the security responsibilities to the Afghan government and forces. Enabling Afghans to take the lead in managing their own affairs is a central plank of the refreshed NATO strategy in Afghanistan. Transition is an incremental process, driven by conditions on the ground and progress made province by province. It must be irreversible and sustainable over the long-term. Transition is not limited to security responsibility. It has been defined along the three main pillars of the Afghan National Development Strategy: security, development and governance. Visible and durable progress in each of these fields will be necessary for transition to start in any given province. Because it is driven by conditions on the ground, there is no set timeline for transition. As Afghan leadership starts assuming primary responsibility in certain areas, ISAF will shift to a supporting role and focus resources on the key districts. After consultations with the Afghan Government, NATO and ISAF Foreign Ministers will endorse the political and military criteria necessary to enable the transition of security responsibility from ISAF to the Afghan Government. These criteria will be assessed across all three pillars of the Afghan National Development Strategy; security, governance and development. This will include an assessment of the security situation and the capacity and effectiveness of Afghan security forces. It will also take into account the capability of the Government at national and provincial levels to effectively deliver justice, improved economic capability, as well as security. While transition must be driven by conditions on the ground and not by the calendar, at least not a European or Western calendar, it does not signify immediate withdrawal by NATO-ISAF. NATO-ISAF and the Afghan Government will work in partnership with UNAMA and other key stakeholders to prepare a common way forward on transition at the Kabul Conference in early summer 2010. "Increased cooperation and engagement with Afghanistan's neighbours, especially Pakistan, is one of the four principles agreed upon at the NATO Bucharest Summit in 2008"
WSN: What are the essential points of the new "Counter-Insurgency (COIN) Strategy"? Is there a conflict between avoiding civilian casualties by informing the public about planned operations and operational security with respect to force protection? General Egon Ramms: The new counterinsurgency strategy is a population-centric one and defines the protection of the people as the mission, starting from the assumption that the conflict will be won by persuading the population--not by destroying the enemy. ISAF will succeed when GIRoA earns the support of the people of Afghanistan. The strategy emphasizes the cultural, social and political complexity of Afghanistan and seeks to address the fears, frustrations, needs and expectations of the people through better security and respect for the local culture and religion not through killing insurgents. ISAF constantly reviews the way it conducts military operations in order to prevent civilian casualties to the maximum extent possible and COMISAF issued a series of directives aimed at protecting civilians and operating in a manner that is respectful of Afghan culture. But, while ISAF does everything in its power to avoid civilian casualties, the insurgents deliberately target civilians with suicide attacks and Improvised Explosive Devices (IEDs). They knowingly stage attacks within heavily populated areas regardless of the likelihood of killing civilians. The counterinsurgency strategy requires a change in our mindset, the way we think and act in order to be successful. In this context, an offensive operation is not only one targeting insurgents, but also one that earns the trust and support of the people while denying influence and access to the insurgents. Another important aspect is partnering. The new counterinsurgency strategy emphasizes the need for the ISAF forces to partner with the ANSF at all levels and build their capacity. The strategy underlines the need for strong ANSF capable to secure their country. WSN: In the overall COIN strategy as well as the concept of transition, the Afghan National Security Forces play a major role. What are you doing to ensure ANSF are quantitatively and qualitatively growing in order to be able to take over the responsibilities for the security of their country? General Egon Ramms: NATO Training Mission-Afghanistan (NTM-A) was established within ISAF to oversee higher level training for the ANA and training and mentoring for the ANP. The launch of NTM-A in October 2009 went hand-in-hand with the establishment of ISAF's Joint Command (IJC), which focuses on operations. Whilst the IJC manages forces in-theatre, including deployed mentoring and training teams, NTM-A is responsible for ANSF institutional training, education and professional development activities as set out by the Afghan Ministries of Defence and Interior. NTM-A coordinates its efforts through the Joint Coordination and Monitoring Board and the International Police Coordination Board. By accelerating progress toward a self-sustaining and capable ANSF, NTM-A contributes to the transition towards Afghan ownership of its own security and affairs. Currently, ANA growth remains on track and overall ANP growth has already exceeded the target ceiling set for October 2010. The overall development of the ANP continues to lag behind that of the ANA, although it is trending upwards. Its authorised strength is 109,000 and 134,000, planned to be reached by October 2010 and 2011, respectively. Having posts in nearly every one of Afghanistan's districts, the Afghan National Police aims to provide security at the local level. The ANP has a key role to play in demonstrating the authority and capability of the Government of Afghanistan to exercise effective control over the whole national territory. WSN: This question goes beyond your defined area of responsibility but you certainly look beyond Afghanistan's boundaries. How do you see the role of the regional actors in finding a solution in Afghanistan? General Egon Ramms: Increased cooperation and engagement with Afghanistan's neighbours, especially Pakistan, is one of four principles agreed upon at the NATO Bucharest Summit in 2008. Military coordination is primarily pursued through the Tripartite Commission, comprising senior military representatives from Pakistan, Afghanistan and NATO/ISAF. Its four main areas of cooperation are intelligence sharing, border security, counter-IED and information operations initiatives. A Tripartite Joint Intelligence Operations Centre, located within HQ ISAF in Kabul, has been established and staffed jointly by officers from the ANA, Pakistan Army, and ISAF. The first joint Border Coordination Centre (BCC) was inaugurated in March 2008 and it reached full operational capability in August 2009. Three more BCCs are under construction on the Afghan side of the border and Pakistan agreed to establish two BCCs on the Pakistani side of the border in late 2010/early 2011. Pakistan also plays an important role in the logistics support of the ISAF mission. Land lines of communication through Pakistan are used extensively by ISAF nations. WSN: What wishes would you ask a genie regarding the future of ISAF's mission in Afghanistan? General Egon Ramms: I would like to sign the first orders for Transition in the Operational Planning Process so that Transition to Afghan authorities could start by the second half of 2011. Although this does not signify immediate withdrawal, it means that, as Afghan leadership starts assuming primary responsibility in certain areas, ISAF will shift to a supporting role and focus resources on the key districts. This will also give a very strong signal that we are moving in the right direction, and thus it will increase confidence of the Afghan people in their government and of the TCNs populations in the fact that our strategy is working. The success of our mission in Afghanistan depends on the political will of the ISAF nations. In this respect, while the military efforts of all the TCNs are impressive, I would like to see an increased engagement beyond the military aspects of the mission. There cannot be only a military solution to the problem in Afghanistan and, while the military is responsible for security, the governance and development aspects go beyond our military capabilities.